Home Business Which countries still don’t sell Coca-Cola? Which countries still don’t sell Coca-Cola? After almost 60 years, Coca-Cola is on sale again in Burma. Coca-Cola is one of the world’s most recognized brands, so are there any countries where the drinks giant still remains unsold? The company says it sells 1.8 billion servings of the drink every day. But for the last six decades, none has been in Burma. That’s because of US trade sanctions on the military junta which ruled the country from 1962 to 2011. Those sanctions were suspended a few months ago, as the country began to move towards democratic reforms. But the company said on Monday its first delivery had arrived and local production would begin soon. Coca-Cola’s entry into any country is a powerful symbol, says Tom Standage, author of A History of the World in Six Glasses. “The moment Coca-Cola starts shipping is the moment you can say there might be real change going on here,” he says. Coca-Cola’s rival PepsiCo has also announced plans to resume sales in Burma. There are now just two countries in the world where Coca-Cola cannot be bought or sold – Cuba and North Korea, both of which are under long-term US trade embargoes (Cuba since 1962 and North Korea since 1950). Cuba was actually one of the first three countries outside the US to bottle Coke, in 1906. But the company moved out as Fidel Castro’s government began seizing private assets in the 1960s, and has never returned. In North Korea – the other Coca-Cola free zone – recent media reports suggested it was being sold in a restaurant in Pyongyang. But Coca-Cola says if any drinks are being sold there, they are being smuggled in on the black market, not via official channels. The dark fizzy soda was created in 1886 in Atlanta, Georgia. From the early days the Coca-Cola company looked to expand worldwide, and by the early 1900s it was bottling the drink in Asia and Europe. But the big boost came as a result of World War II when Coca-Cola was provided to US troops overseas. There were more than 60 military bottling plants for Coca-Cola around the world during the war, and locals got a taste for the drink too. It became powerfully associated with American patriotism, says Tom Standage, and was seen as so crucial to the war effort that it was exempted from sugar rationing. Dwight Eisenhower, at the time the supreme commander of Allied forces in Europe, was said to be a particular fan and he ensured its availability in North Africa. He also introduced the drink to top Soviet general, Georgy Zhukov, who asked if a special, colorless version – one that looked like vodka – could be made, and Coca-Cola duly obliged for a while, says Tom Standage. These days Coca-Cola is regularly ranked as one of the top, if not the top, global brands. “It has always been about the American dream,” says Bruce Webster, an independent branding consultant who has done work for the Coca-Cola company in the past. But not all countries have embraced the American-ness that seems to be embodied by Coca-Cola. It was the French who first coined the pejorative term “coca-colonisation” in the 1950s. Trucks were overturned and bottles smashed, says Tom Standage, as protesters saw the drink as a threat to French society. During the Cold War, Coca-Cola became a symbol of capitalism and a faultline between capitalism and communism, says Bruce Webster. It was not marketed in the former Soviet Union due to the fear that profits would go straight into communist government coffers, says Tom Standage. Pepsi filled the gap and was widely sold. When the Berlin Wall fell in 1989, many East Germans bought Coca-Cola by the crate-load, says Tom Standage. Other than the former Soviet Union, the main region that Coca-Cola has struggled in historically is the Middle East, largely due to a boycott implemented by the Arab League from 1968-1991, as a punishment for it selling in Israel. Pepsi picked up a lot of the sales in the Middle East – and many local versions of the drink thrived. Coca-Cola is not trying to get involved in politics, says Bruce Webster, but as a huge brand so closely associated with the US, it sometimes finds itself tangled up in politics, or singled out for criticism. “The whole strength of the brand is plugging into a way of life that so many people wanted. As an ideology, it polarizes. And sometimes those associations become unattractive,” he says. In 2003, protesters in Thailand poured Coca-Cola onto the streets as a demonstration against the US-led invasion of Iraq, and sales were temporarily suspended, says Tom Standage. Iran’s president Mahmoud Ahmadinejad has threatened to ban Coca-Cola and Venezuela’s Hugo Chavez recently urged people to drink locally-made fruit juice rather than drink Coca-Cola or Pepsi. 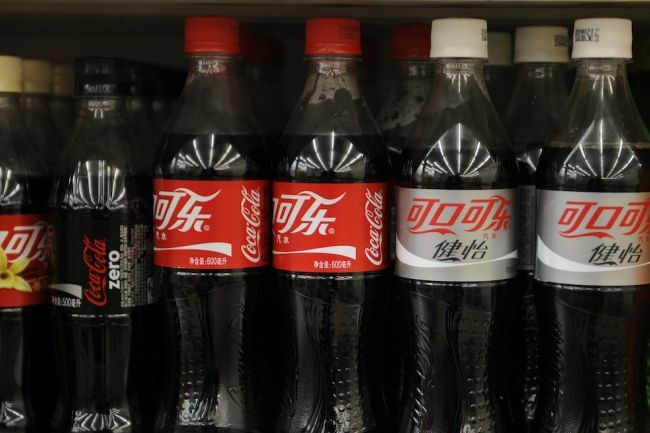 But 126 years after its birth, Coca-Cola is still pushing forward in terms of sales, with strong growth – especially, it says, in the emerging markets of India, China and Brazil. • By 1930 Coca-Cola was bottled in 27 countries around the world.